There are so many things to admire about Scandal’s female lead Olivia Pope, almost as many things as there are to admire about the actress who plays her. The highly-esteemed Kerry Washington covers Marie Claire UK's May issue, and, as much as I adored Washington in the transparent long-sleeved white blouse she donned on the April cover of Marie Claire US, I definitely prefer the summer-dress-wind-swept-hair combo she's got going on for the British edition of the glossy. Everything about Kerry Washington screams confidence, and her May cover is no exception. Her brown eyes look fierce with purple shadow across the top and bottom of her eyelids (#eyeshadowgoals); her lips lie slightly parted, painted with a matte pink that enhances her whole face. Her caramel skin glows against a white backdrop that has me mulling over the idea of a spray tan in the near future. I'm also completely obsessing over her white tube top dress with flower embroidery. The left hand corner of the issue is reading my mind: "Hello Summer." As today just happens to be Wednesday, I think it's safe to say Washington is the perfect Women Crush candidate, but Lena Dunham may have beaten us to the punch, folks. 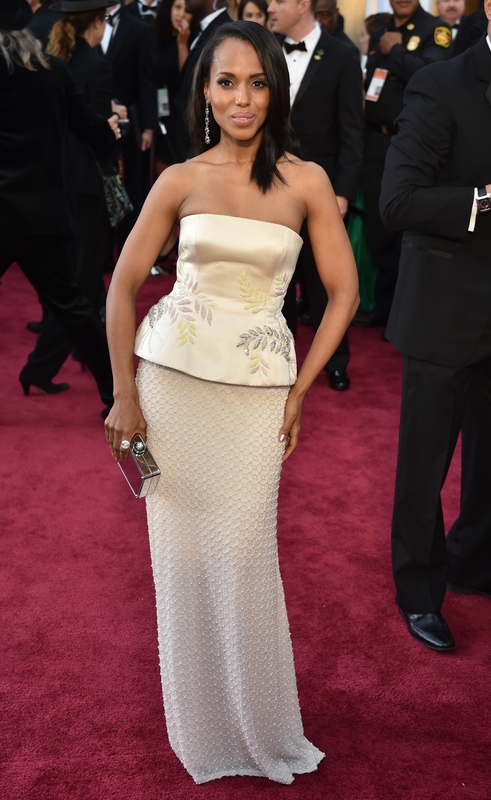 Judging from many a magazine cover and the actress's Scandal-themed collection for The Limited, I'd say Kerry Washington has found her way into the fashion industry's good graces.